What Trello Triggers and Actions Does Zapier Support? New Label Added to Card - Triggers when a label is added in a Trello card. Card Moved to List - Triggers when a Card is moved to a List in Trello, inside the same Board. Card Updated - Triggers when a Card is updated in Trello. New Notification - Triggers when you get a new notification in Trello. New Card - Triggers when a new card is added. New Label - Triggers when a new label is created in Trello. New Member on Card - Triggers when this Trello account joins a card. New Board - Triggers when a new board is added. New Activity - Triggers when there is activity in Trello. New Checklist - Triggers when a new checklist is created in Trello. New Comment in Card - Triggers when a Comment is added to a Card in Trello. Card Archived - Triggers when a Card is archived in Trello. New List - Triggers when a new list on a board is added. Create Comment - Writes a new comment on a specific card. Add Members to Card - Adds one or more members to a specific card. Delete Checklist in Card - Deletes an existing checklist on a card. Add Attachment to Card - Adds one or more attachments to a specific card. Complete Checklist Item in Card - Completes an existing checklist item in a card. Add Checklist to Card - Adds a new (or existing) checklist to a card. Copy Board - Creates a copy of an existing board. Create List - Adds a new list on a specific board. Update Card - Update a card's name, description, due date, or position in list. Close Board - Closes a board without permanently deleting it. Create Label - Adds a new label on a specific board. Move Card to List - Moves a specific card to a list on a specific board. Add Label to Card - Adds an existing label to a specific card. Create Board - Creates a new board. Remove Label from Card - Removes an existing label from a card. Create Checklist Item in Card - Creates a new checklist item in a card. Create Card - Adds a new card on a specific board and list. Archive Card - Archives a card. Find Board - Finds a board in your Trello organization by name. Find Member - Finds a member in your Trello organization by name. Find Checklist - Finds a checklist on a particular board or card by name. 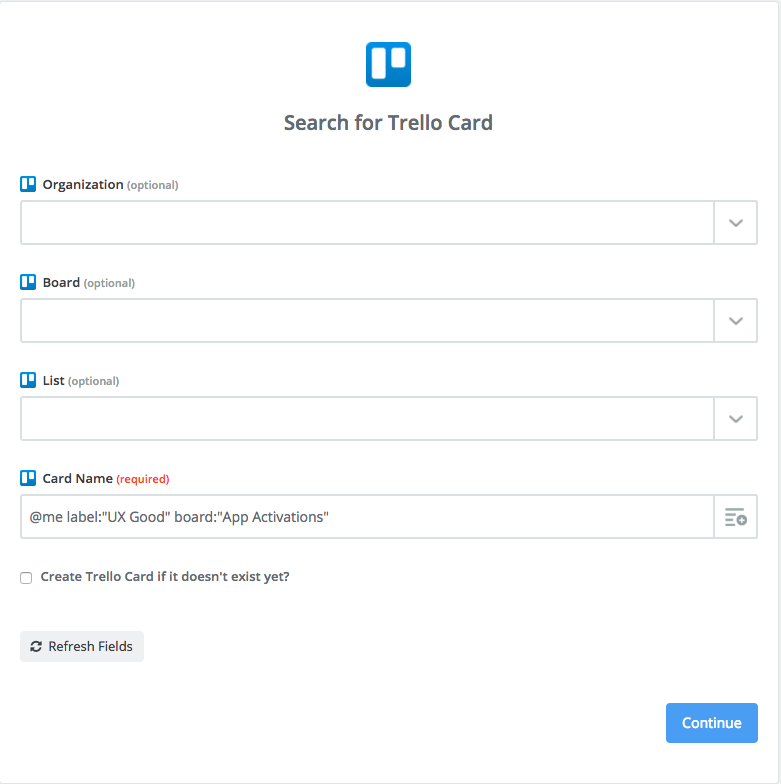 Find Card - Finds a card in your Trello organization by name, given a specified board and list. Does not search archived cards. Find Checklist Item - Finds a checklist item on a particular checklist by name. Find List on a Board - Finds a list on a particular board by name. Find Label on Board - Finds a label on a particular board by name. Admin/owner permissions - You don't need extra permissions to access any Trello resources, but some things won't trigger/appear if you haven't joined the board you need, so make sure you've done that! 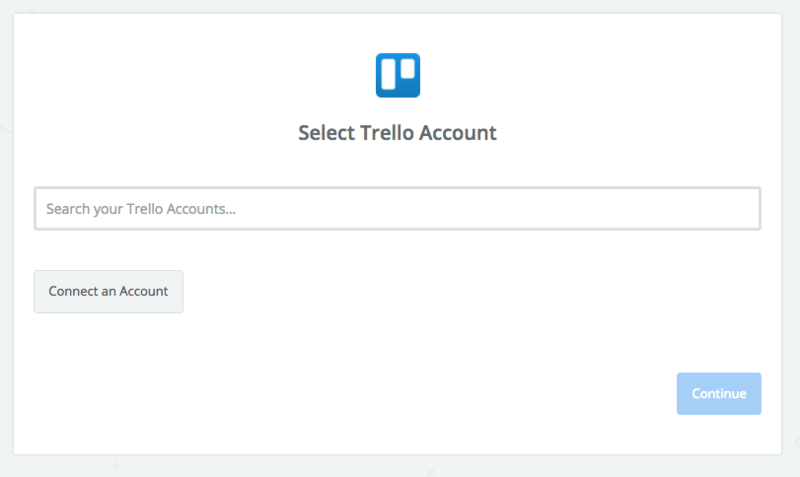 Paid/versioned account - Any plan (free or paid) and any version of Trello can access the integration. Custom field support - Yes for some triggers/actions/searches: New Card, Card Moved to List, New Activity, Create Card, Update Card, and Find Card. Trello will now ask for you to confirm via a popup, just click Allow (and login if it asks you to login!). After you login and permit Zapier access, you should return to Zapier after a moment. We'll then test the connection to make sure everything is set up properly. After that, just continue on down! New cards are created on a schedule (e.g. daily, once a week, once a month). To do that, use a Schedule trigger to set up the creation of those cards—see step-by-step directions or click below. New cards are created when a card is closed—see step-by-step directions. If you're using the New Activity or New Comment in Card triggers, you'll need to select a board to monitor. Not selecting a board means that only activities (or comments) that were created by you will be triggered. With a board selected, all activities and comments will trigger the zap. For Trello New Card triggers, we provide the clickable URL directly. However, if you use New Activity or you will need to look for Data Card URL or similar. This will vary based on what sort of item triggers the activity. For example, cards vs. comments vs. checklists all generate activity, but have the clickable URL on different labels. New Notification doesn't give you a direct URL, so you will have to build it yourself. 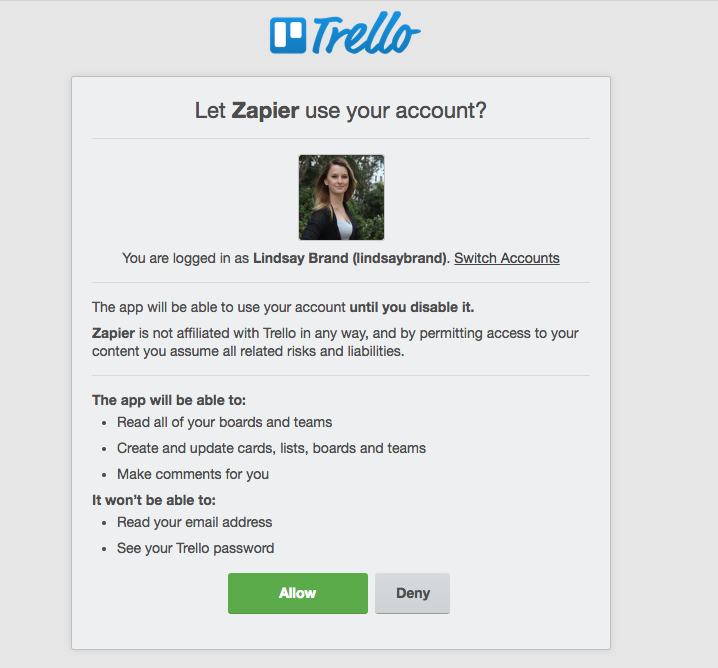 Zapier supports both private and public Trello boards. If you are trying to trigger on new cards across all boards on your Trello account, you will need to be a member on those cards in order for the Zap to pick them up. Alternatively, you'll need to build a zap for each board you want to trigger new cards off of. In rare cases, Trello actions can run into Trello's API limits, which are 300 calls every 10 seconds. If you see an error like this, if you're able to have fewer items trigger at once that will help. Also, adjusting your zap so that it uses fewer items that result in extra API calls, like due dates and checklist items, can help avoid that error. The current "Move card to a different list" action only works for moving between lists on the same board. You can't move a card to a different board, but you can create a card on a different board that has the same name and description. This can happen if you have lists with the same names across multiple boards. To solve this, make sure to always reselect both the board name and the list name in the zap editor if you copy a zap. Trello has some special operators that it uses for search. You can use them in your search via Zapier to look up a card. For now we aren't able to get to Trello Power Up fields in triggers or actions, so that info isn't accessible in a zap. 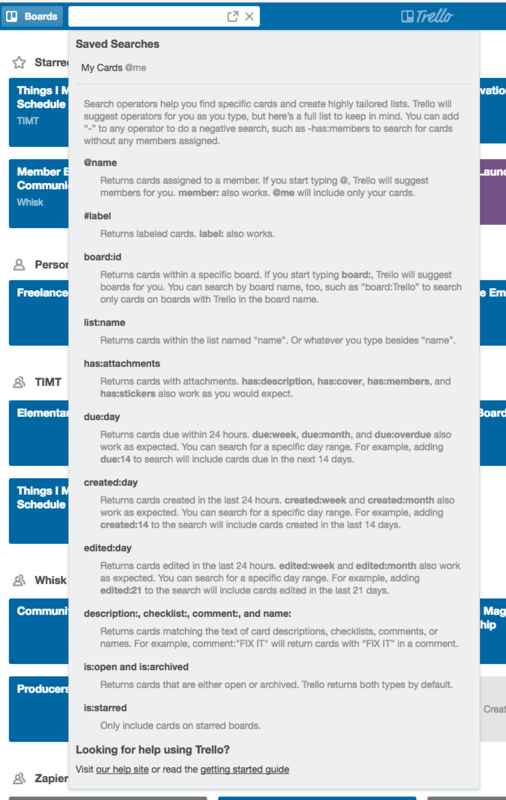 When you move a card from a board into another board, it's considered a "New Card" by Trello. The "Card Moved To List" trigger only works when a card is moved from one list to another, inside the same Board.